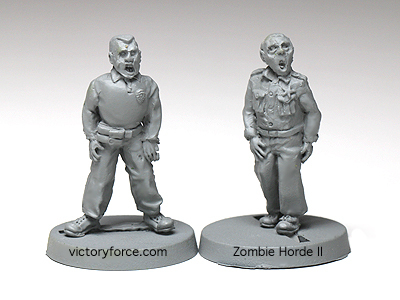 The Zombie Horde Set II: First Responders has many different law enforcement type zombies within its ranks. Here are just two examples. Some look like local Sheriff types others look like riot or SWAT type types. You can find the Zombie Horde II in the Creatures Section of the Victory Store. This entry was posted in Spotlight and tagged creatures, miniatures, spotlight, zombies. Bookmark the permalink.